You can enhance the appearance of ordinary plastic buckets by coating them with the appropriate type of paint. 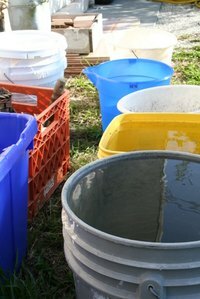 Because plastic buckets are slick and nonporous, they won't absorb the chemical adhesives in paint. You must sand the plastic to create a rough surface to which the paint can adhere. In addition, depending on the way you intend to use the bucket, you should employ a particular application strategy. Work outdoors, or cover your work surface with drop cloths. Scrub a plastic bucket with dish soap and a coarse sponge. Rinse the bucket with water, and dry it with clean towels. Sand the bucket with 120-grit sandpaper until it feels slightly gritty. Protect portions of the bucket you don't want painted with painter's tape. Apply acrylic latex primer to the inside and outside of the bucket with a paintbrush meant for use with latex coatings. Wash the brush with water. Let the primed bucket dry for two hours. Apply acrylic latex paint with a paintbrush. Let the paint dry for two hours. Add an additional coat if the primer shows through. If you plan to use the bucket to hold sharp, abrasive objects, use an acrylic enamel. If you plan to hold corrosive materials in the bucket, don't paint the interior. The finish will fail. Never prime an unsanded plastic bucket, or the finish will chip. Never paint a bare plastic bucket, or the paint will peel.